New England Clam Chowder Recipe is a cream based soup. 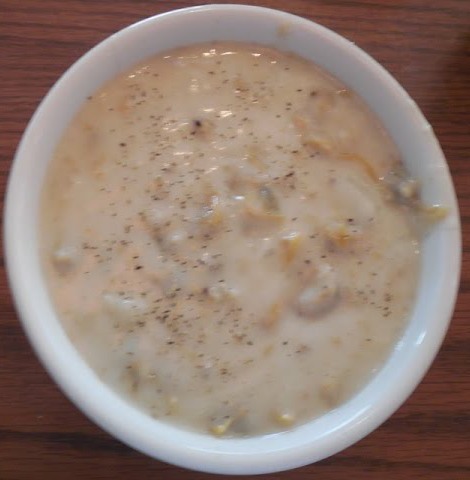 New Englanders often times use the word quahog to describe England Clam Chowder. Quahogs replaced the fish in cream based stews of England and France to become New England chowder. New England clam chowder is sometimes called Boston Clam chowder. The word chowder is recognized from the French chaudière , which translated means pot. The Bald Chef Glen Izett Makes a great pot of classic New England Clam Chowder. I love this soup recipe because most New England clam chowder recipes taste like pudding. This recipe is lighter yet still full bodied for a great New England Clam Chowder. I believe New England Clam Chowder Recipe may be one of the best clam chowder recipes I’ve ever tasted is light bodied and full of clams and creamy goodness. New England Clam Chowder is made by Steaming 36 fresh clams, shucked and chopped remove clams from the clam stock. Save 1 quart of the clam broth. Sauté in a large pot 3 slices of chopped apple bacon until crispy remove. Add 2 tablespoons of butter and 4 tablespoons of flour to make a roux cook for 2 minutes. Add one fine cut onion and 2 tablespoons of minced garlic. Add the 1 quart of clam stock to the roux and cook for 15 minutes. Add 2 medium potatoes cut fine, shucked and chopped clams 2 cup half-and-half add 1/2 teaspoon salt and Freshly ground black pepper. Then reduce heat and simmer for 10 minutes. This New England Clam Chowder might make you fat but it’s so good! Looks delicious and easy to make, gonna try this recipe for sure:)Â Thanks! New England Clam Chowder was meant for fishermen who needed the calories and to keep warm while fishing. 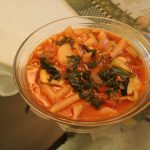 i have never liked the Manhattan style chowder and never will. and i don’t understand why your tsp of celery seed is red when you ad it. I’m with you, Manhattan over New England, hands down! Â Thanks for the recipe btw, will have to give that one a try. Glen, Thanks for the healthier version.Â I wondered too about filtering the water. I thought maybe a coffee filter or cheese cloth. This looks wonderful!Â Great job. Yeah, red chowder’s the best. However, I’ve found that a little bacon to saute the vegetables gives it extraordinary flavor. Nice. Keep the vids coming Glen.